Three years ago in 2015 fashion designer Matthew Williamson, globally renowned for his “bright bubbly prints and unabashedly pretty clothes”, as the high priestess of US Vogue Anna Wintour once described them, quietly closed his shops and began to wind down the fashion arm of his brand. There was no grand finale catwalk show or over-blown press releases, simply an absence from the 2016 London Fashion Week programme and a carefully-crafted announcement stating he was moving to online sales only. And it’s not that it went unnoticed, such a re-structuring wasn’t particularly unusual at the time, catwalk shows were widely agreed to be losing their allure, and sales in bricks and mortar shops were dipping across the board. It’s just that such was the lack of accompanying fanfare, no-one in fashion thought for a minute that this might mean no more dresses. After all, Williamson was at the top of his game. In 2007 the late great Prince had taken to the catwalk with an impromptu performance at his 10th anniversary show, the same year he’d had a retrospective at London’s prestigious Design Museum. Three years after that, there’d been a weighty Rizzoli monograph penned by elder statesman of fashion writing Colin McDowell, and Williamson’s statement dresses regularly made the red carpet thanks to long-standing A-list fans like Sienna Miller and Thandie Newton. But, dial it all down he did. Why? Simple. His creativity had found a new form of expression: interior design. Besides, all the while the frocks were grabbing the headlines, Williamson had been steadily amassing an impressive ‘lifestyle’ portfolio. As far back as 2003 he collaborated with The Rug Company on a series of carpets using prints from his ready-to-wear range; then came stationery for luxury leather merchants Smythson, and in 2008 wallpaper for Habitat. And, since 2012, following the success of a diffusion fashion label for Debenhams department store, he’d created a bi-annual homewares collection for the brand, think bedlinen to cushions, alongside names like John Rocha and Julien Macdonald. 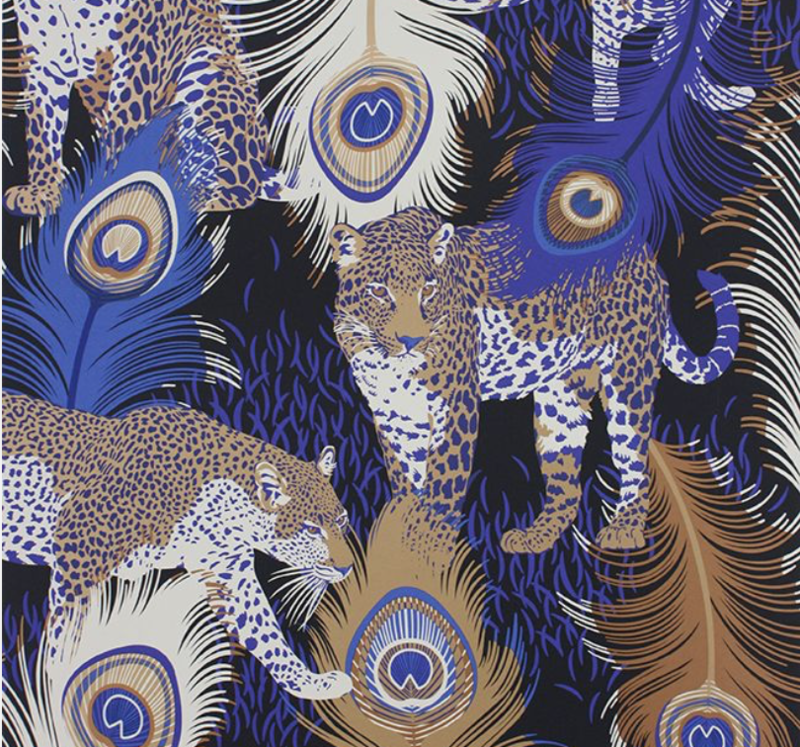 Howver, the collaboration which really distinguished him from the pack was his first collection in 2013 with leading purveyors of fine fabrics and wallpaper, Osborne & Little. 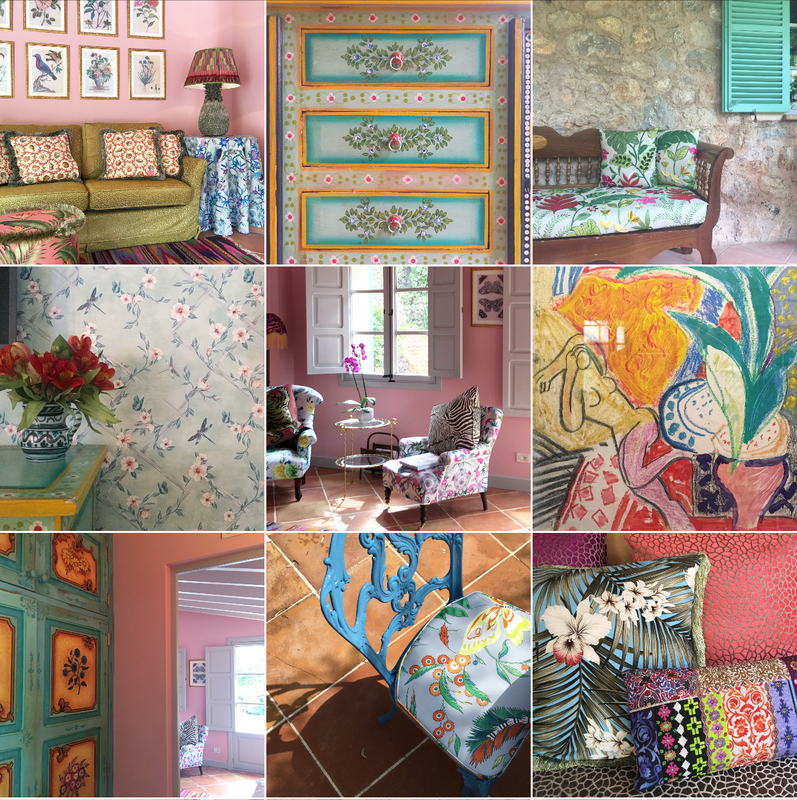 With this, the hand-painted peacocks and exquisitely detailed humming birds so beloved of his clothing were now available to upholster our sofas and paper our walls. Such was the confident aplomb of this debut, it was swiftly followed by commissions to decorate the Bridal suite at Aynhoe Park, a 17thCentury stately home in Oxfordshire; the courtyard garden at the Kensington boutique hotel Blakes, and in 2016 one step up again with an entire range of furniture and lighting for the British manufacturer, Duresta. It really was only a matter of time before the space-making side of the brand he founded in 1997 with ongoing business partner Joseph Velosa, came to the fore. 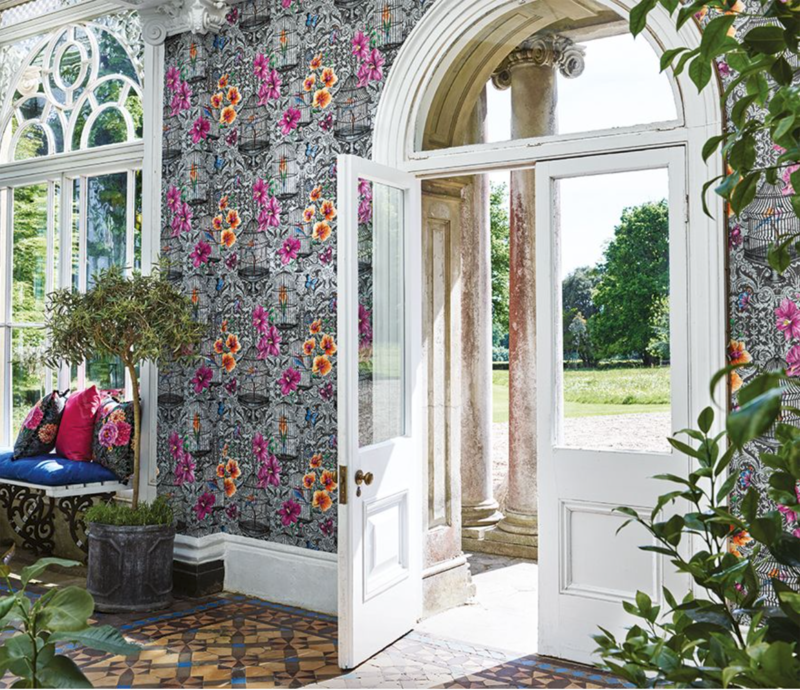 Osborne & Little’s Managing Director Peter Osborne sums up the appeal: “Matthew was an obvious choice [for us] since his style and idiom, and indeed reputation, was Pattern and Colour, both with capitals! We were looking for a fresh, and different approach to both, and the end result has been an impressive catalogue of beautiful designs distinctly MW. It now represents a significant part of our group sales and will continue to be increasingly important.“ A fifth collection, ‘Deià’, named after the Mallorcan town that Williamson now calls home, is due to launch in September. But it’s by no means a given that any fashion designer can make the transition from frocks to homes as seamlessly as Williamson has done. Success depends on the strength of the creative vision in the first place, and the authenticity of the inspiration from which it springs. For Williamson, the richness of his aesthetic was established at the very beginning as areaction to the perceived greyness of his native Manchester. “Every collection I’ve ever done has been inspired by nature in one form or another, the more exotic the better. Exotic countries and sun-drenched landscapes are what really capture my imagination.” Consider then his heady trademark palette of jewel-tones from soft to acid bright, the kaleidoscopic patterns and vivacious prints all audaciously mixed and mis-matched; simply throw in a bit more ruching, pleating and feathery trims, and they are the precise ingredients of his interiors too. It’s clear that his signature, remarkably consistent in a way that few brands manage, has simply transferred medium. Additionally, a genuine passion for interiors must be innate. It can’t be learnt. For Williamson it was always there, starting with his childhood bedroom which was regularly re-coloured to suit his burgeoning tastes; the final iteration before leaving home “a ghastly lavender shade from Homebase for the walls, with silver paint for the woodwork.” Photographs of an early bedsit in Gray’s Inn Road reveal a tiny kitchen with vivid pink cupboards covered with images of tea cups, each meticulously snipped from a roll of wrapping paper. His subsequent studios, shops and homes have regularly been featured in glossy magazines, often making the cover because they were seductive in a way that made you seriously consider the possibilities of a turquoise bathroom. And his latest project, Suite 67 at the exclusive Belmond La Residencia hotel in Deià, Mallorca, favoured locale of Gwyneth Paltrow to Kate Moss, looks set to assuage any last doubters about this transition. 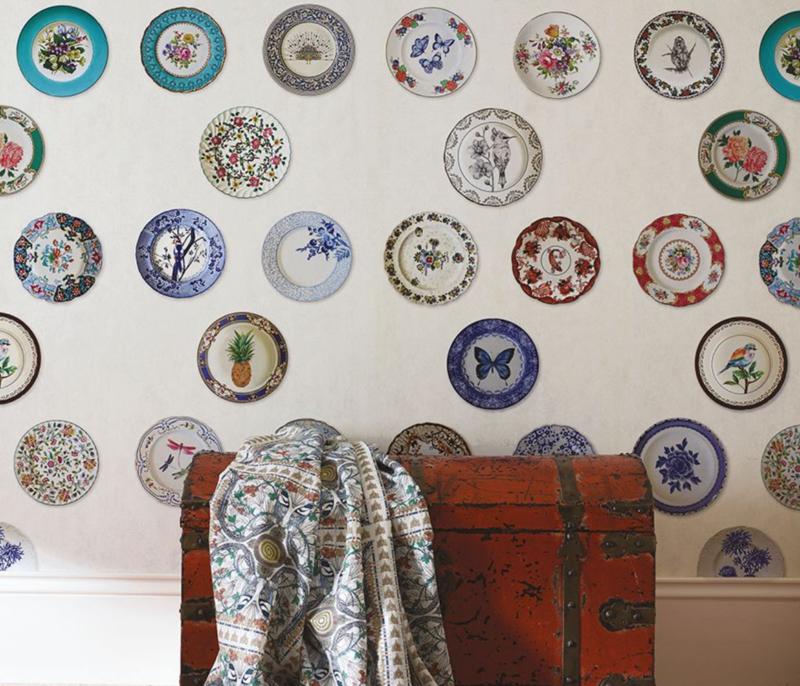 It’s an accomplished assemblage of pieces and papers from his various collections peppered with quirky touches which will no doubt become his interior hallmarks — think jolly pink Maribou feather trimmed lamps, hand-painted vintage furniture and gloriously-patterned wallpaper used unexpectedly on ceilings and inside cupboards. The ‘Ceramica’ paper from the Autumn 2017 ‘Belvoir’ collection by Matthew Williamson for Osborne & Little. And it’s perfect timing too because as the world appears to be going a bit bonkers, decoratively speaking, it’s time to live for the moment and do in our homes as we damn well please. Upbeat and joyful is what we all need right now. As Williamson says, “I’m fascinated with creating spaces which evoke a sense of joy, optimism and personality; spaces which marry a sort of rustic earthiness with touches of grandeur and decadence. 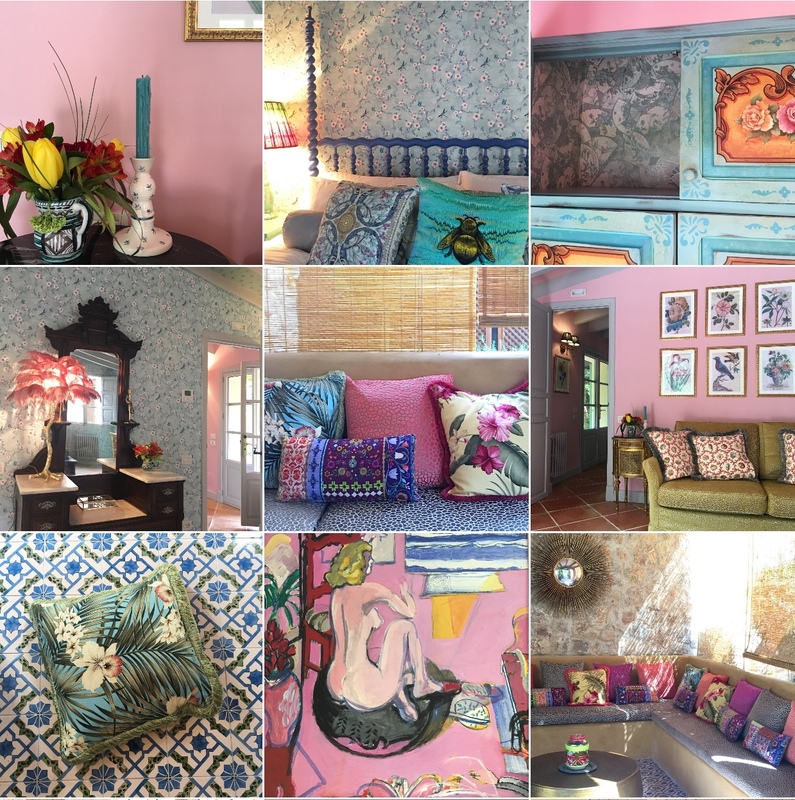 Much like my clothes I guess.” All hail the new Happy Design: magical, mood-enhancing interiors, and breathe anew, for fashion’s favourite romantic hasn’t left us, he’s simply opened a door to take more of us to the bright side. A shorter version of this piece was first published in The Observer Magazine on 24 June 2017.